Nick Lima, the standout player for the USA in its two most recent games, took what is now an unconventional path to pro soccer. He didn’t specialize in the sport during his teens, he played four seasons of college ball -- got his degree at Cal -- and then signed a professional contract. MVP on his debut: Nick Lima debuted for the USA in the 3-0 win over Panama, playing in the midfield but retreating to right back when needed on the backline. His cross, after winning a midfield tackle, set up the USA’s second goal. Coach Gregg Berhalter presented him with the game ball: “When you think about the complication of the position we asked him to play today, it was a high level. And he did a great job dealing with it. ... The effort and the drive on that one play, to win the ball in transition, and serve it in for an assist, that’s amazing.” Lima also started in the 2-0 win against Costa Rica a week later and again provided one of team's top performances. One will often find, with the nation’s elite players, that they’ve come from a family with soccer background. That was not the case with Lima, who grew up in Castro Valley, which lies 20 miles south of Berkeley and 30 miles north of San Jose. “No one in my family was a soccer player, but my influence was my dad, to replicate what he did and try and make him proud,” said Nick, whose father, Livermore-Pleasanton Fire Department Captain Chris Lima, has been a firefighter for 28 years. 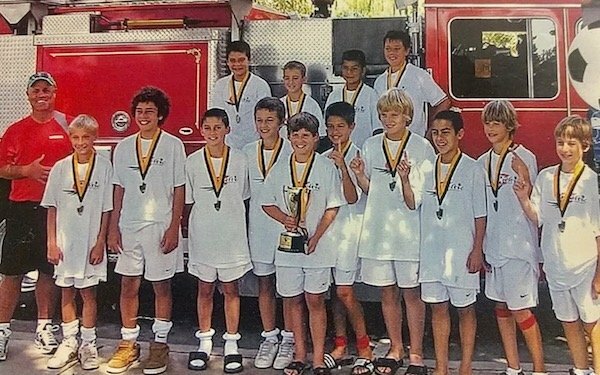 While Nick aimed to become a firefighter like his dad -- “Hopefully, I can do that post-soccer career” – he excelled in football, basketball, baseball and, of course, soccer. Chris and Kimberly Lima, ahead of the USA's 2-0 win over Costa Rica at Avaya Stadium, where Nick Lima also plays for the San Jose Earthquakes. The location of both Nick's college and pro teams have been convenient for them to keep attending Nick's games. Chris and Nick’s mother, Kimberly, signed Nick up for pee-wee soccer at age 3 in Castro Valley, and he started scoring goals from the get-go. At age 9, Nick moved on to competitive ball, first with Ballistic United. “He was never a bunch-ball player,” says Chris. “The incredible thing about Nick is he's always had field vision. You could tell he could anticipate what was going to happen from an early age. Hugh Kinnear (far left) coached Nick Lima (second from right on sidestep) with Mustang Celtic. Mustang coach Hugh Kinnear first saw Nick Lima when he came to a tryout at age 11. He had been told to be on the lookout for the talented young player – but that was unnecessary, because Lima stood out immediately. "And, Nick, he takes it in stride. He's a really humble guy, which is nice. He's real appreciative of everything, which is pretty great." Chris says that Nick was kicking a ball around as soon as he could walk. “I don't know if he had any formal training before he got to me, but he was already good,” said Kinnear, a middle school math teacher. “And I think he got good because he liked it and he kicked the ball. Sometimes he couldn't get rides, so I'd pick him up at his house in Castro Valley and he was kicking the ball while he was waiting. He had little goals at the side of his house. You could tell by looking at the ball he'd been kicking the snot out of it." Lima also played basketball through middle school, he excelled at short-stop in baseball, and for Castro Valley High School he played running back, corner back, on special teams, ran back kicks, and he took kickoffs and PATs. The Development Academy, in its early years when Lima played for the Quakes, wasn’t as heavy-handed as it is now about preventing kids from playing other sports. Lima was heavily recruited as a defensive back by Ivy League schools, but soccer had become Lima’s favorite sport. Lima moved on to the San Jose Earthquakes Development Academy team and had a stint with De Anza as well. The Quakes sent him to train with partner club Tottenham Hotspur, and he had the options of going pro, playing college soccer, or Ivy League football. Becoming a Brazilian-style outside back. Lima went to Cal in nearby Berkeley as a center forward, and during his freshman year came off the bench in 19 games on a Bears team that was ranked No. 1 in the nation for six straight weeks and reached the NCAA quarterfinals, falling to Maryland. After the season, Cal coach Kevin Grimes decided that Lima should be an outside back. “I was center forward, a No. 9, up till then,” said Lima. Telling a center forward to be a defender doesn’t usually go down well for a player who thrives on scoring goals. But Grimes made his case. Grimes envisioned Lima as a traditional Brazilian outside back, like Cafu and Roberto Carlos and, more recently, Dani Alves. "He's a tough kid," said Kinnear. "He's a good tackler. He's very athletic. Good in the air. And it gave him space so he could exploit the talent that he had. It was a good move by Grimes." Position changes had worked out well for previous Cal players, such as future MLS players A.J. Soares and Steve Birnbaum, whom Grimes moved from attacking roles to central defense. “Nick was no different than the others,” Grimes said, “initially a bit of a hesitation and some questioning. Once we were able to piece together for him the role he would be playing – ‘You are an attacking thrust. You're not just a guy who sits on the backline and defends all day. Quite the contrary’ -- he embraced it. College grad goes pro. After his fourth season at Cal, Lima graduated in 2016 with a degree in Interdisciplinary Studies and joined the Earthquakes, who held his Homegrown rights, for the 2017 season as an outside back. In his first two pro seasons, Lima played 56 games, starting 54 of them. As Berhalter aimed to rebuild the U.S. national team after its failure to reach the 2018 World Cup, he saw in Lima a player who could handle a complex role in a formation that required a player to move between outside back and central midfield throughout the game. Lima handled it superbly in the wins over Panama and Costa Rica and looks to be one the players from the marathon January camp who has a future with the team when the foreign-based players enter the fold. “He had all the natural ability to be a great defender,” said Grimes. “Physically he's fantastic. He's courageous and competitive. He's great on the air. Fantastic going forward. I think where we came in for Nick was teaching him the nuances of playing right back from a defensive standpoint. 21 comments about "Nick Lima: The multi-sport athlete, college grad, aspiring fire-fighter who's shining for the U.S. national team". Kent James, February 4, 2019 at 12:57 a.m.
frank schoon, February 4, 2019 at 7:45 a.m. Sounds like a real sweet kid, who had a lot of natural talented ability. But the way it looks to me as that when he rose to play higher levels of soccer it became more difficult for him to score due to the improved competition. Too bad his coaches weren't able to teach him more of the finer aspects of scoring that is needed as he a rose up in the level of play, but i'm sure they will continue to remember him through all the trophies he's won for them. Like at Ajax, kids who played wing had to compete with better wingers for a position and therefore those missed that extra were moved back to outside back. R2 Dad, February 4, 2019 at 12:03 p.m.
Great reporting, feel-good story of the spring camp. I'm happy for him and his family, who got out of the game what they needed, which is the most important thing. For 99% of the kids out there, they should be following this path if it presents itself. But I'm selfish--I want our top players playing at the highest level, for the longest amount of time. He's getting his first caps at age 24--way too late. Alternately he could have played 1 year at Cal, started playing professionally at 19 and finished up the degree in the offseason/nights/weekends, which is way easier to do now than it was for previous generations. If he's 20, he has 10 years to give to the Nats--now he has only 6, and the development that should have happened in his teens has been delayed. We've never had a world-class outside back (IIRC) a la Roberto Carlos. Additionally, since he's only now showing up on our radar, his transfer potential (Garber's ears start burning) has been diminished since the window to transfer to a bigger league has been curtailed (bigger leagues don't want to take a chance on "older" players). And since scouting in this country is...primitive, ney primordial, he was never called into Nats U camps. Wooden Ships, February 4, 2019 at 1:27 p.m.
Is he maybe more effective than Yedlin right now? He seems more complete, especially in attacking. R2, I wouldn’t preclude him because of his age, he very well could have 10 strong years ahead of him. Generally, I agree with playing against the best as early as possible, however we shouldn’t rule out outliers. Berhalter might surprise and begin to identify players that have been traditionally overlooked in the states. As a General Manager and several years later as a college coach I never went exclusively by a recruiting matrix. There are surprises and exceptions to the rule/norm. These past two games included 3 players that I knew little of ( paid much attention to ), Lima, Lewis and Mahailavic. They’ve got game. frank schoon replied, February 4, 2019 at 4:18 p.m. Ships. Lima ,I think, is more versatile than Yedlin. In a 4-3-3 , Lima could play as right halfback,as an attacking midfielder and has good defensive capabilities. Wooden Ships replied, February 4, 2019 at 6:37 p.m.
Agree with you on both counts Frank. Bob Ashpole replied, February 4, 2019 at 11:50 p.m. I agree that those three were a pleasant surprise. Hard to compare Lima against Yedlin using the last 2 matches. Just looking at him though, he has athletic and ball skills. Have to see if he gets a callup next month. I also wonder if he can play both right and left sides. That would be welcome. John Soares, February 4, 2019 at 1:30 p.m.
r2d, way to find a dark cloud. R2 Dad replied, February 4, 2019 at 1:46 p.m.
Aucontraire, Monsieur Soares! Referees see, upclose, how players perform and interact with opponents and teammates. We are a valuable-yet-unused resource. I am not a scout, but intelligent scouts (if we had any) would ping referees as to who is an upcoming talent in their neighborhood, and why. We see it all, and are much more impartial than coaches, who always have an agenda. Referees, in general, just admire skillful players, not the robots the DA seem to generate. Wooden Ships replied, February 4, 2019 at 6:47 p.m.
R2, you raise a very good point regarding a referee’s perspective. The fascinating thing with all this is, it’s subjective. As with coaches, scouts, referees too would have differing views. What is a consistently high performer? R2 Dad replied, February 4, 2019 at 10:15 p.m. Ships, if USSF was a finely tuned watch and change wasn't required, we're playing semifinals at the world cup, I'd say Steady As She Goes and my comments would just be whinging. But, Couva happened. And USSF has basically ignored this fact--they're on cruise control, and I don't think that's good enough. So change IS required. What is that change? Maybe including referees in the process would help tighten the net so that Nick Lima gets a call up to a U17 camp and was on the radar of the people that run Carson. Because that clearly didn't happen. Christian Ramirez is then a known quantity back at U18. But no, USSF scouts just shrug because their dance card is full and besides, we already have Michael Bradley and Zardes and Kyle F-ing Beckermann. As far as consistently high performance, that is a process thing, measuring progress over time, reviewing performance in camps. I personally think, if our country is so large as everyone keeps saying, we should be have double the number of camps, so we don't leave rocks unturned. Wooden Ships replied, February 4, 2019 at 11:49 p.m. I agree R2, I personally know we’ve left out better quality players for a few decades now. The USSF has been rigged for far to long. Unfortunately the voting stakeholders are pretty much entrenched. Here’s to hoping Berhalter surprises. A high quality consistent performer isn’t terribly difficult to spot. Christopher Lima, February 4, 2019 at 4:40 p.m.
frank schoon replied, February 4, 2019 at 6:05 p.m.
beautiful game, February 4, 2019 at 4:58 p.m.
Not one mention of Lima's soccer IQ by anyone...every top player has it and it's for the coaches to recognize it and give him/her the opportunity to hone the other skill sets. frank schoon replied, February 4, 2019 at 6:01 p.m.
beautiful game, February 5, 2019 at 6:40 p.m.
Frank S..Soccer IQ is a constant attribute, if a player has it he can develop the technical skills and nuances of the game to reach a higher level of performance...a player like Yedlin doesn't have the soccer IQ to reach the next level while a player like Zardes has mediocre soccer IQ and is leveled out at his best in mediocrity at any level of soccer. frank schoon replied, February 5, 2019 at 10:17 p.m.
BG, that might all be true, but I need to see a player in the various situations for me judge the level of IQ he has. On a lighter note Garrincha was so dumb that the coach of Brazil during the WC’66 made him sit outside of the locker room during tactical discussions. Garrincha was one of the all time greats. Go figure! frank schoon replied, February 5, 2019 at 10:24 p.m.
stewart hayes, February 5, 2019 at 11:34 p.m. I have enjoyed watching him play. He is one reason I went to see the team play against Costa Rica. I hope he keeps it up. Having a career after soccer makes these years icing on the cake. Craig Cummings, February 16, 2019 at 9:26 p.m.
kevin is a great coach, i really liked reffing his teams games. Before during and after his games, a very classy coach. We need more like him.